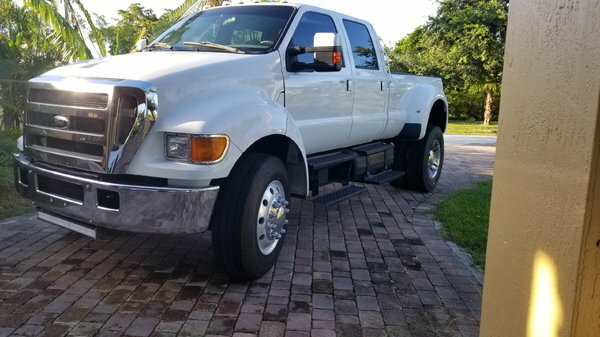 Excellent Condition 05 650 Super Duty pickup. Million mile Capable and custom built by Blue Diamond Ford. Interior has been completley hush matted to cut down on road and engine noise. I have all the manuals for mechanical and electrical on CD. Has 131K miles, 4 door with Harley davidson interior. Has Cummins 5.9 290Hp/525tq 6 sp. auto. New goodyear steering, Bridgestone drive tires on new Alcoa rims. Newer brakes and service. Cold A.C., train horns that are very loud!! 150 gallon tanks. Hydraulic brakes. Selling for 45K or trade for 55 Chevy or 71 Cuda. Oliver LS1 6.2" rods with Mahle H Series STD bearings.